AMPed regularly hosts a variety of events for its members. Check out our past professional and social events, and see why AMPed events are not to be missed. A networking breakfast for members and international business industry professionals. In the second grad workshop, EY's Oceania Campus Operations Manager walked us through through interviews and assessment centres, providing us with the tips and tricks to ensure we were prepared and we could stand out from the crowd. It was a grad season and crunch time! AMPed and UQMAS teamed up to secure PepsiCo's Talent Acquisition Advisor and a recent grad to pass down their knowledge, tips and tricks to ensure we knew what is needed to land your dream grad job. After months of guilt free Netflix (and …), the beach, and over-eating, it was time to get back to reality – back to university and back to school! AMPed and QUTASA joined forces to deliver a pub crawl so wild, so fantastic, and oh so fun it was not to be missed. AMPed and JAMS put your social media and pop culture knowledge to the test in their fun-filled 2016 Trivia Night! Across a night of good times as we recapped the gems (and duds) social media and pop culture have given us over the years. With exams over and holidays in full swing, we celebrated the end of 2015 with an epic Barefoot Bowls Sunday Sesh. Our members put their best (bare)foot forward, as we took to New Farm Bowls Club for an afternoon of good times. The event culminated in an awesome party, making the Sunday Sesh truly epic. AMPed's 2015 Executive Team recapped the exciting year that was, highlighting key events, initiatives and more. Following the election of the 2016 Executive Team, old and new members celebrated AMPed's successes at the Botanic Bar. CAANZ and QUT's Business Societies partnered to present the 2015 Trivia Night, a Mental Health Week event raising awareness of mental health. To start the conversation about mental health and raise much needed funds to help eradicate youth suicide, students from multiple faculties joined us for a night of conversation, trivia, food, drinks and inevitable inter-club and team banter. All proceeds from the night were donated to The Jed Project. AMPed's semester two panel night featured advertising, marketing and public relations decision makers. Attendees were treated to inside knowledge on what industry look for when hiring graduates, plus tips and tricks to help land their dream job. Eight fantastic industry professionals joined us for our first International Business Lunch. Our guests networked with members, shared their industry experiences and provided greater insight into existing opportunities and potential career pathways for IB students. 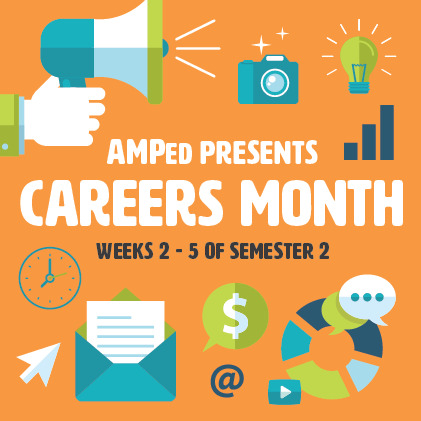 The pinnacle event of AMPed's Careers Month saw members put the skills they had developed into practice as they networked with advertising, marketing, public relations and international business professionals. The night was a great success, with members expanding their networks, making new connections and learning from industry professionals. Across AMPed's first Careers Month, a series of specialised workshops were held. The workshops covering resumes and personal branding, internships, interviewing, networking, Photoshop and InDesign were designed to help our members become the perfect candidate for internship and graduate positions. The month culminated with the 2015 Networking Night. The QUT Business Societies (AMPed, BAMSA, QUTASA and QUTEFS) joined together to create the winter wonderland that was the QUT Business Ball 2015. Students from all faculties were dressed to impress as they enjoyed an extensive drinks package, exquisite canapés and an after party. AMPed's first industry panel night for 2015 featured a panel of recent QUT graduates who had landed dream entry level jobs in advertising, marketing, public relations and international business. Our panelists discussed their roles, facing challenges and networking, in addition to busting myths and answering questions. 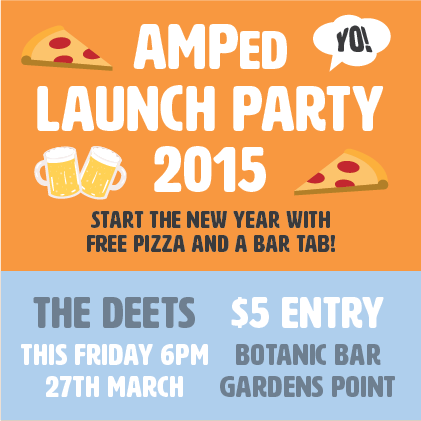 AMPed kicked off its relaunch with a Launch Party to remember at the Botanic Bar. With pizza, a bar tab and great company, the night was the perfect opportunity to meet peers and make new connections while having a couple of cold ones on us.